The 23rd UN climate summit is officially in the books. This year marked the first time that a COP took place in Bonn, Germany – right outside the UNU-EHS offices. Staff from all academic sections of UNU-EHS were involved, taking part in 40 events and making a splash with their newest research. Read more. The Livelihood Protection Policy (LPP), a climate insurance product devised by the Munich Climate Insurance Initiative (MCII), hosted at UNU-EHS, was one of the award-winners of the UNFCCC award, and is a clear example of how bringing diverse actors together can shift the way an industry thinks about climate change. Unlike many other types of insurance, the LPP extends coverage to some of the poorest and most vulnerable people in the Caribbean, a region hit hard by worsening hurricanes in the last decade. Read more. As world leaders gathered in Bonn for COP23 under the presidency of Fiji, on the Pacific Islands climate change is already affecting people’s lives. 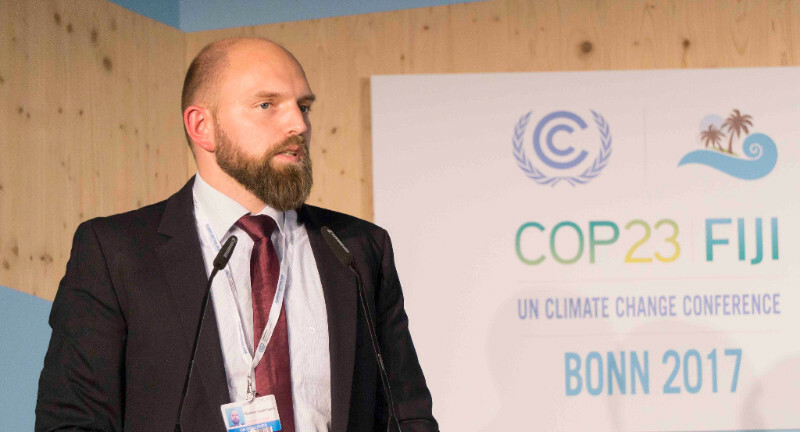 But despite the early ratification of the Paris agreement by all of the Island states, application on the ground is proving challenging – as new research by our legal expert Cosmin Corendea shows. Read more. At the start of talks in Bonn, UNU-EHS, Social Impact Partners and the InsuResilience Secretariat launched the InsuRisk Assessment Tool, which assesses not only the disaster risk of low to lower middle income countries, but also their readiness to accommodate insurance solutions. Read more. Dr. Matthias Garschagen introduces the new InsuResilience tool. Dr. Simone Sandholz speaks to Phoenix about Climate Change Adaptation.